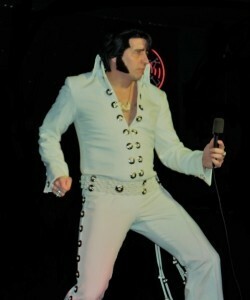 Elvis Presley Tribute Artist. Top quality backing tracks using real instruments and costumes made by B&K Enterprises in the USA who employ those who designed and made Elvis's own stagewear. All lighting and PAT tested P.A. system included in the pricing. 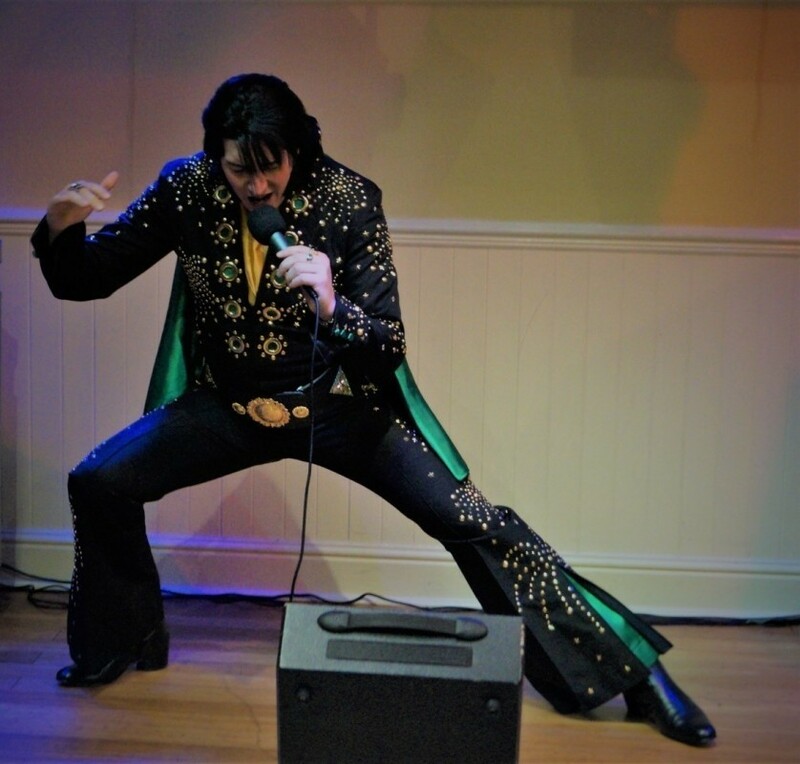 James has been a life long fan of Elvis Presley and when performing as Elvis, tries to convey his charisma and sense of playfulness on stage which he combines with his own personality. Complete with stage lights and top-quality backing tracks, James can perform for an hour or for two 45 minute sets. 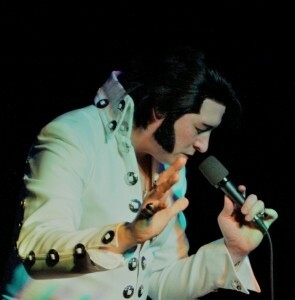 By choosing from the available songs on his website, you can also customise your Elvis set list. For those who need one, James will also provide a disco for your event, either before or after the Elvis act - or both if wanted. The disco is also available separately and is hosted by a profess ... ional DJ with over 20 years experience playing for live audiences - he knows how to keep the dancefloor filled! While he still enjoys singing songs by various artists, performing as Elvis is what he enjoys the most. His Elvis Tribute is already proving very successful in the area and would make an excellent addition to your next event. We recently had James to entertain us at my Captain’s Day evening event. What a star. 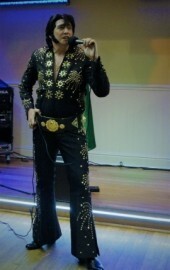 Not only is he an excellent singer who sounds like Elvis, he engaged and interacted with the audience superbly. I’ve had so much positive feedback about James’s performance from club members. He made my Captain’s Day a very memorable one for all the right reasons. If you’re looking for superb entertainment in the form of an Elvis Tribute act, look no further than James and I promise you will not be disappointed. 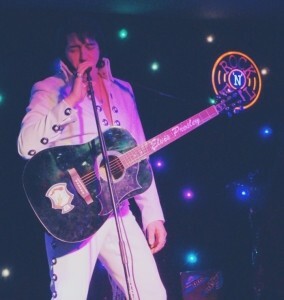 A brilliant evening with Elvis entertaining! Great impersonator and interactive with audience. Such a lovely evening. More of a heavy metal fan myself but I really enjoy his performance. 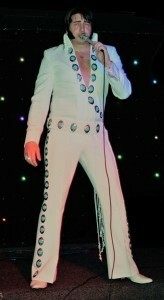 Great entertainer who really embodies the spirit of Elvis. Definitely worth catching if you get the opportunity. 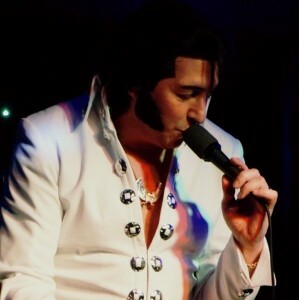 James has taken his Elvis act to many public houses, music venues, weddings and birthdays around the South West and surrounding counties. His 18 years as an award winning national and regional radio DJ means he is comfortable in front of a crowd and knows how to entertain in a relaxed manner. He is also a lifelong Elvis Fan and was in the top three Elvis Tributes at 2016's famous Porthcawl Elvis Festival and was a finalist in 2017's European Elvis Championships. Wedding Reception Entertainment Birthday Party Entertainment Private Parties Corporate Events Christening Entertainment Product Launches Trade Shows Christmas Party Events Gala Dinners Jewish Weddings After Dinner Entertainment Public House Entertainment Social Club Entertainment Sports Club Entertainment Theme Nights Residential Homes. 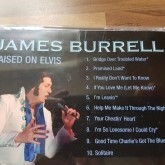 My tribute CD "Raised On Elvis" - 10 Elvis tracks that I enjoy performing.